Saturday. 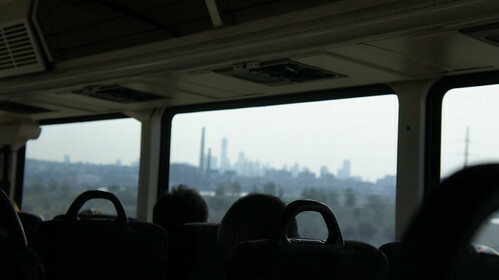 We’re halfway to New York City on an NJ Transit bus. 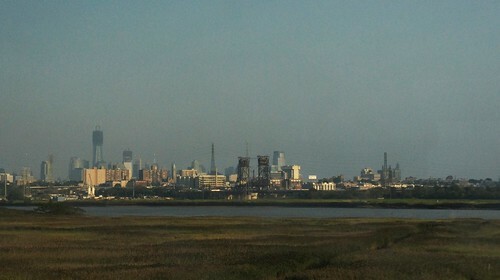 To our left is Newark, to our right the brown marshes and post-industrial blight of the Meadowlands, and beyond, the gleaming Manhattan skyline peeks out over a hill, and over it all, the new WTC Tower, still unfinished, its cranes raised like the spindly arms of some stick figure cartoon. I try to get a picture, but there’s a special difficulty to taking photos from a bus speeding across the Meadowlands; in motion the real visual density of the place becomes apparent. 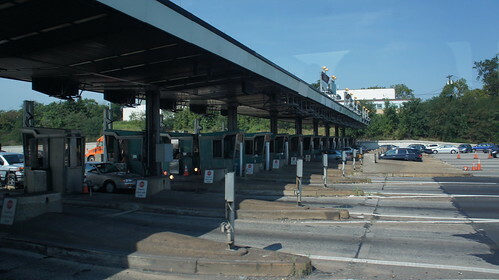 Every moment, a different obstacle passes by — trucks, power line towers, rocky outcrops, trees, signs, toll plazas, bridges, Secaucus Junction, all passing by just as you hit the shutter. And sometimes the camera decides to focus instead on the seats in the foreground rather than the city itself, and you decide to keep that photo anyway just because the depth-of-field effect looks nostalgic in its own way. There are a precious few seconds on the Lincoln Tunnel Helix when Midtown Manhattan is spread out before you across the East River and there’s time for a quick photo before you’re in the tunnel. 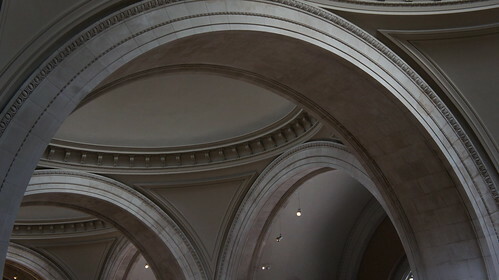 It’s a hazy day and the light is all wrong, but New York is New York, so it looks good anyway. 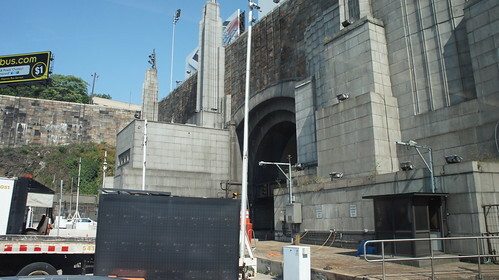 The entry to Lincoln Tunnel itself, and later the approach to Port Authority Bus Terminal, present huge, looming, monolithic faces to the traveler. 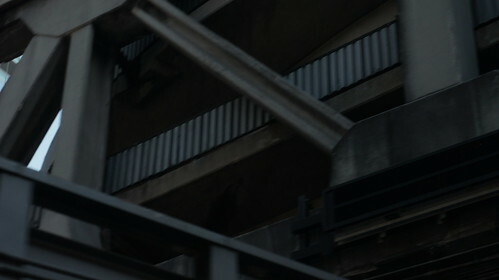 The Bus Terminal especially resembles a boxy cephalopod from this angle, tentacular ramps and bridges writhing down to the ground, drawing a stream of buses into multiple crosstrussed maws. We tarry around the shops of Midtown waiting for the lunch buffets to open. 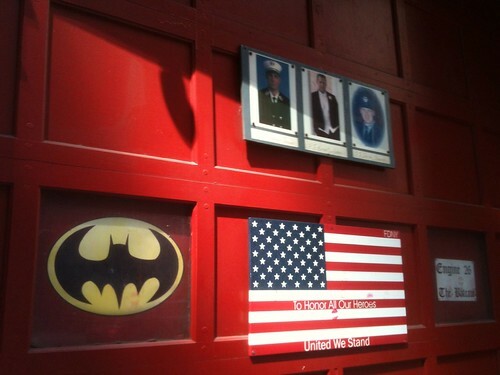 At some point we pass by a firehouse with a Batman logo out front beside a memorial to fallen heroes. 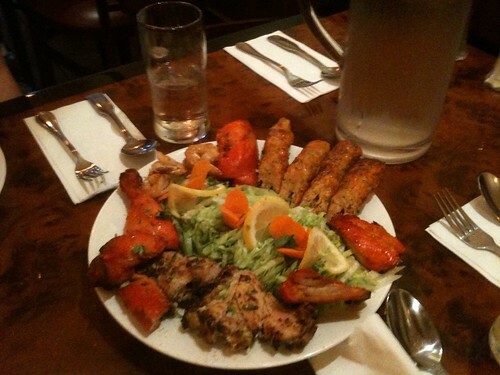 Our target restaurant, Touch of India, turns out not to have a weekend lunch buffet, but no matter; the tandoori mix platter is a glorious dish of grilled meats, more than filling with some aloo gobi, rice, and naan. 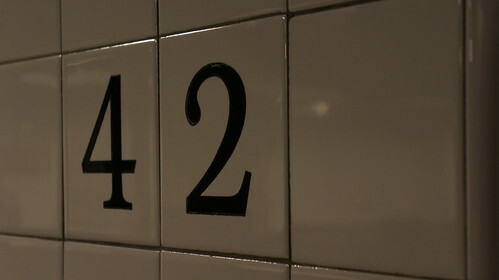 En route to the Met my favorite number presents itself in the subway. It’s the answer. 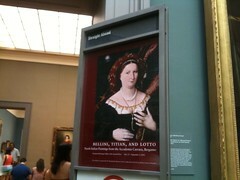 I never tire of The Metropolitan Museum of Art. 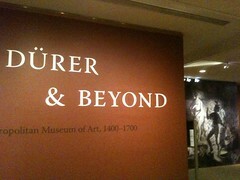 (I suppose I could say the same of any good museum, though.) Today we’re renewing our Associate memberships, worth a year of four visits at the standard donation amount. 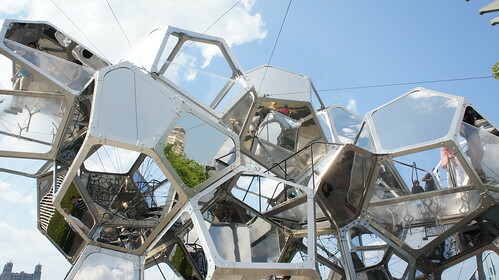 We also go up to the roof deck to see Saraceno’s Cloud City, a hivelike sculptural installation of glass and steel overlooking Central Park. We don’t have the timed entry tickets necessary to ascend into the sculpture, but for today it’s enough to see it alongside the view of the city. For now it’s time to catch our bus back to NJ. 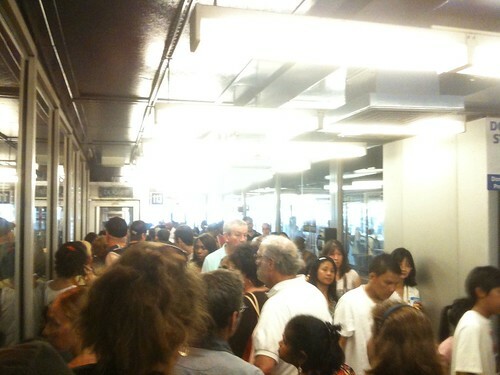 We get back to PABT with just enough time to run up the escalator, get a ticket at the machine, and join the back of the line in the crowed upstairs waiting tank. The bus arrives, the driver walks off, leaving the bus idling at the gate — and doesn’t come back. We wait. No announcements are given, Ten minutes, twenty minutes, thirty. A young, heavyset con artist shows up and addresses himself to the crowd, with an unconvincing sob story that Greyhound has screwed him over and that he needs some cash to get back home to Roanoke, VA. His high voice has no trace of Virginia in it. Amateur. People are of course angry and confused by waiting at this point, and he gets nothing. Finally, we head back downstairs and walk over to Penn Station to get an NJT train instead. Much faster and more comfortable. A pair of New Jersey housewives sit near us, conversing loudly about every kind of food imaginable. 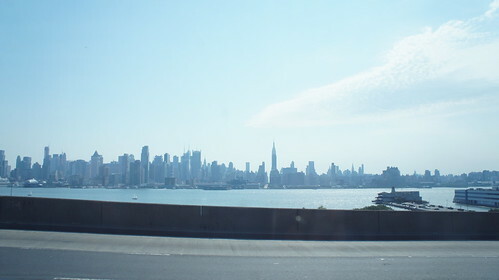 I finally manage to get that photo of the skyline that I couldn’t get from the bus earlier. 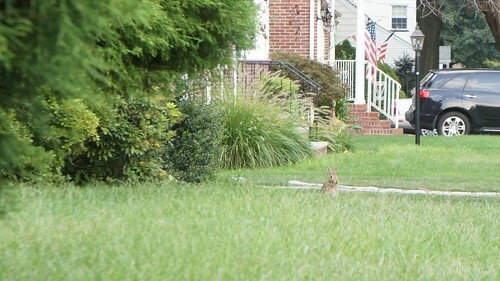 Back in New Jersey later that evening we see a bunny. More photos from our Labor Day long weekend on Flickr.